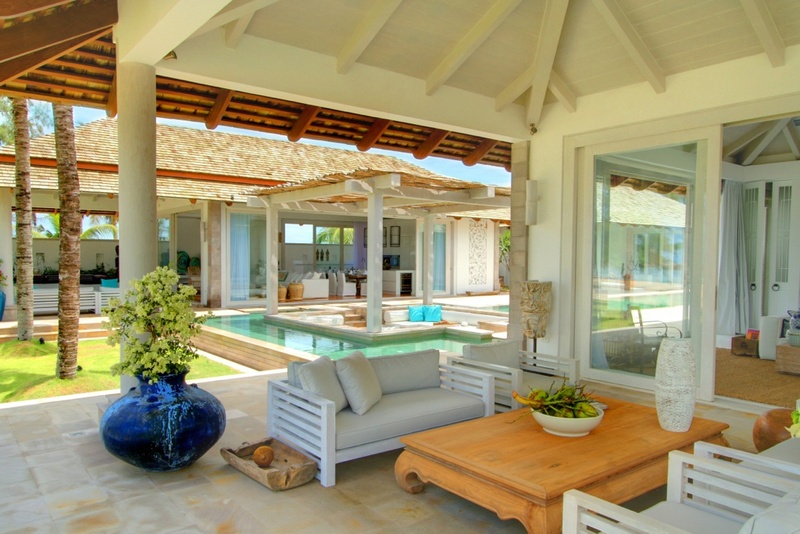 This extraordinary beachfront villa provides a pleasant surprise when you first arrive at the rear of the property. 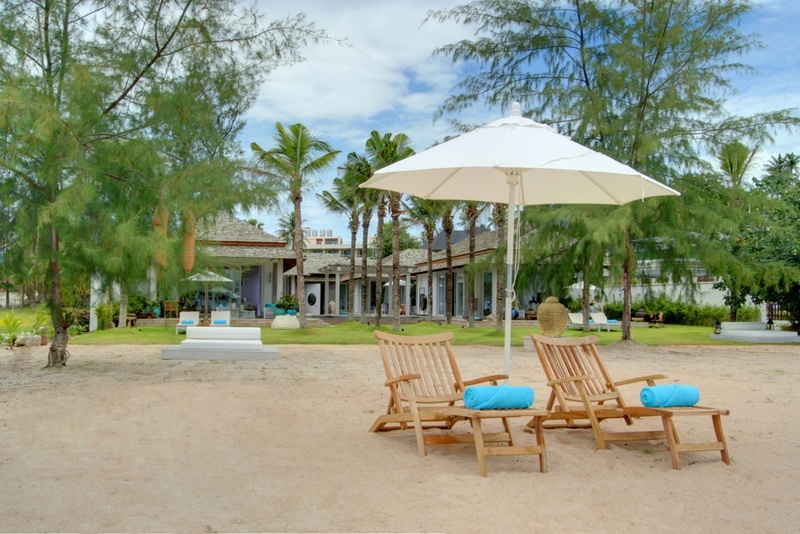 Turning off the main Chaweng Beach Road, a short drive leads through a cluster of stylish resorts before opening up right onto the beach at the north of Chaweng Bay. 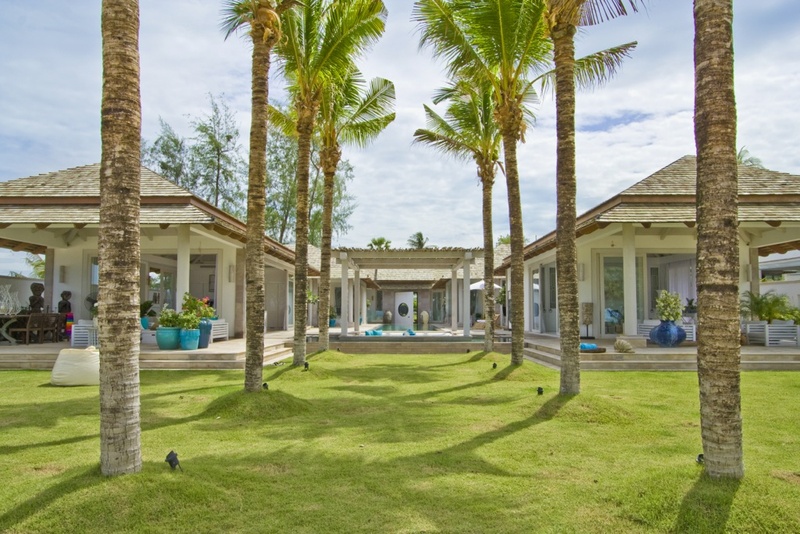 The vision of villa Mia, sat on the left, is almost as eye-catching as the beautiful island of Koh Matlang which lies straight ahead. This is the closest point between the two islands and at low tide it’s even possible to walk the white sand bank all the way across. You enter the villa from the rear and you can tell by the plant lined driveway and architectural style that this is going to be something special. 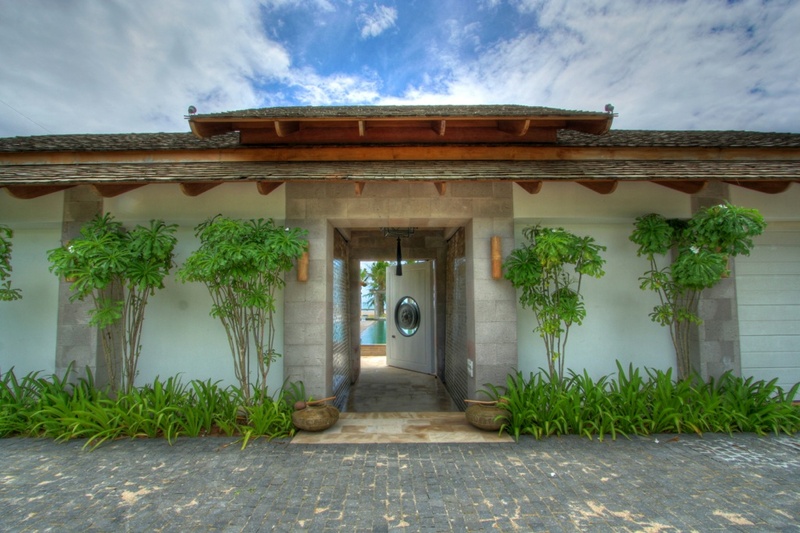 The incredible entrance has an antique metal gong set into a glass circle and appears to be floating in the centre of the imposing white wooden door. When the door swings open you’re treated to an instant impression-forming view that this is the epitome of style and luxury beachfront living. Many modern luxury villas successfully combine architectural styles, décor influences and a blend of contemporary and traditional features. But at Villa Mia this has been achieved with an understated air of superiority. 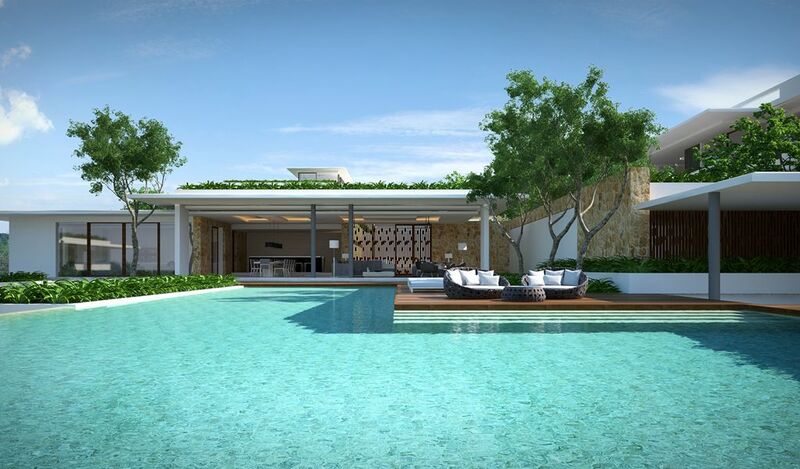 In essence, the architecture follows the Balinese format of having three pavilions positioned to form a central courtyard enclosing the swimming pool and directing the focus out to the beach and the ocean. It’s immediately obvious that the villa has a very contemporary feel with white being the predominant colour throughout indoor and outdoor spaces. In many white-themed villas the décor is brought to life with stark contrasting bright coloured accessories, which often works to good effect. But here the home is animated with much more subtle use of colour and patterns and a splattering of stylish antique artifacts and furniture pieces. The entrance pavilion faces the ocean and on the right of the impressive entrance is a large garage area. To the left is a fitness room and then the staff quarters. 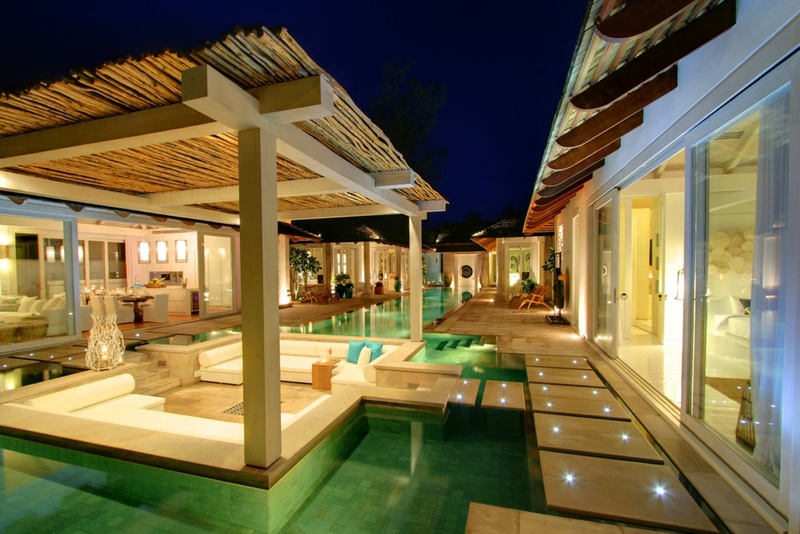 The two pavilions on either side of the central swimming pool make up the villa’s living and sleeping areas. 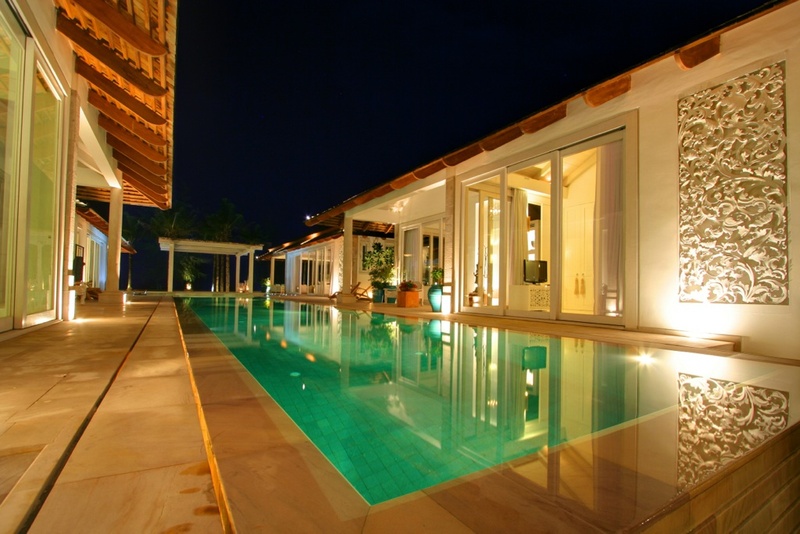 The long swimming pool is cleverly incorporated into the living areas and forms an integral part of this villa experience. 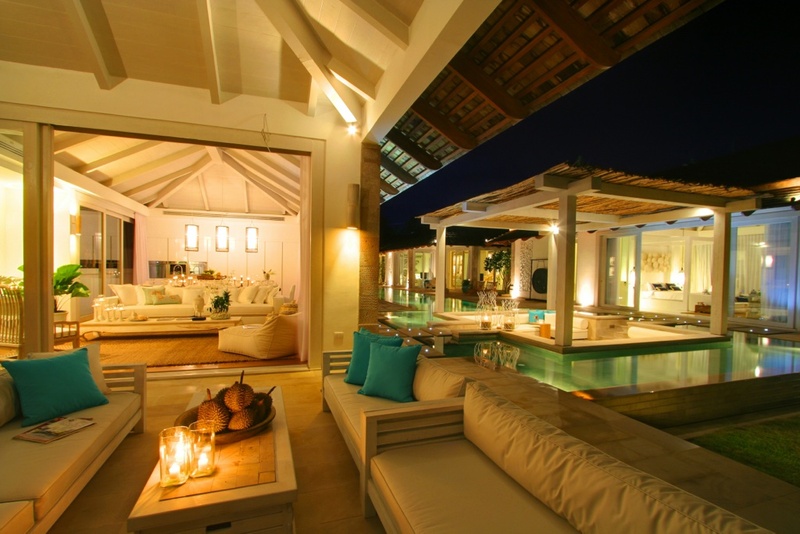 The pool extends into the pathways with the use of stepping stones and, at the beach end, stepping stones on either side lead down into a covered sala area complete with comfortable seating from where you can relax with pool on either side of you and the ocean directly ahead. This is truly an idyllic spot and an exceptional feature of the property. In the pavilion on the right, the first room you come to is a very well designed double bedroom. 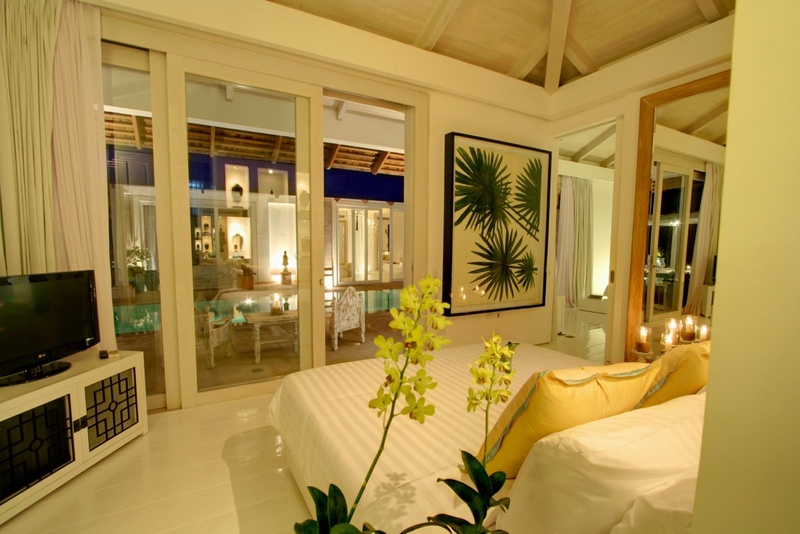 Overlooking the pool the room offers great views and the interior styling in here mirrors the other rooms in the villa. Walls, floors and ceilings are all white with oversized frames holding vibrant green leaves providing the perfect accessories. 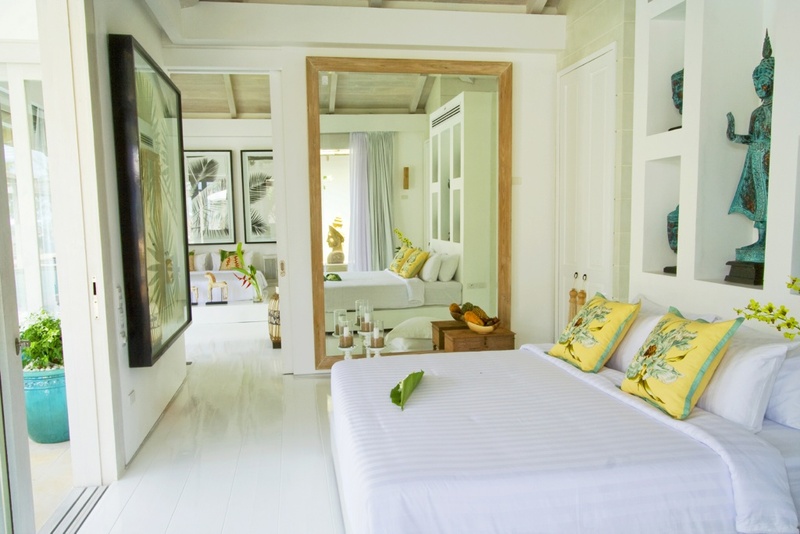 Large mirrors hang on walls and the bed is decorated with a green runner and floral patterned cushions. A central walkway leads into the phenomenal en-suite bathroom. Twin sinks are situated on either side, there’s a walk-in shower room and doors opening to a private outdoor courtyard with tropical planting, stone sculptures and wooden decking surrounding an indulgent oversized terrazzo bathtub. This room has connecting door leading to the next double bedroom. In here the bed sits against a floating wall under a vaulted ceiling giving an overall feeling of space. The wall is adorned again with framed leaves and an enormous mirror. 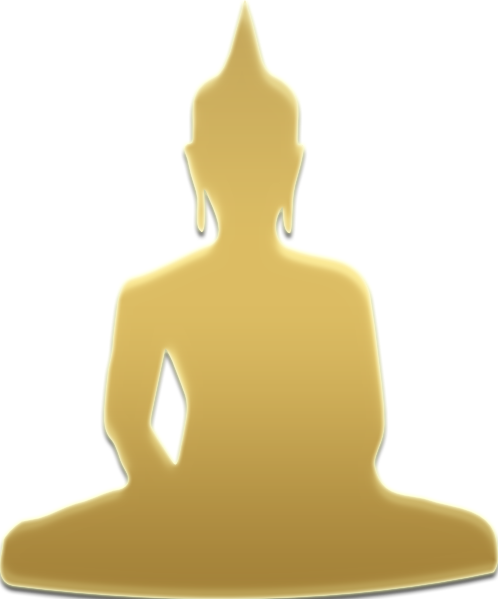 White angel statues on the floor contrast well with the verdigris Buddha images mounted in alcoves above the bed. Behind the floating wall is the en-suite bathroom with twin-sinks, walk-in shower and doors to the outdoor shower area. Coming back onto the poolside walkway you will find ornate candle holders, intricately carved antique furniture and beautiful bougainvillea in colourful pots. 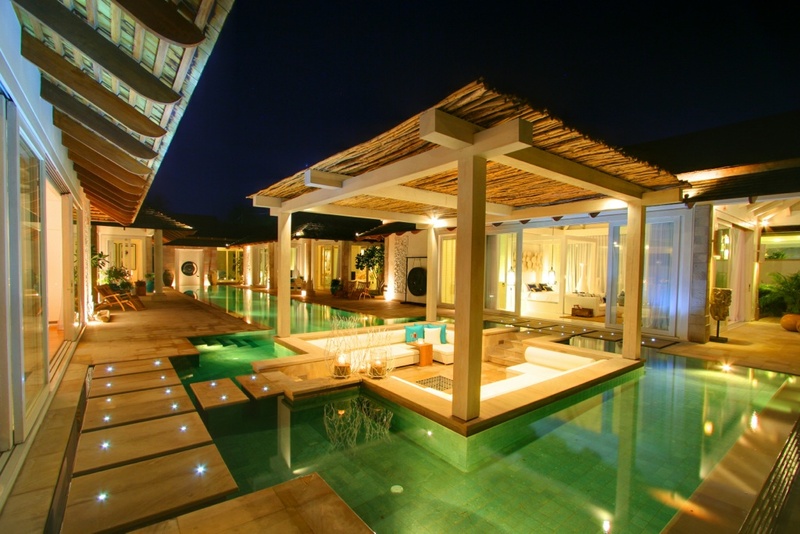 The stone terrace surrounding the pool has sunken spotlights which really bring the area to life at night. 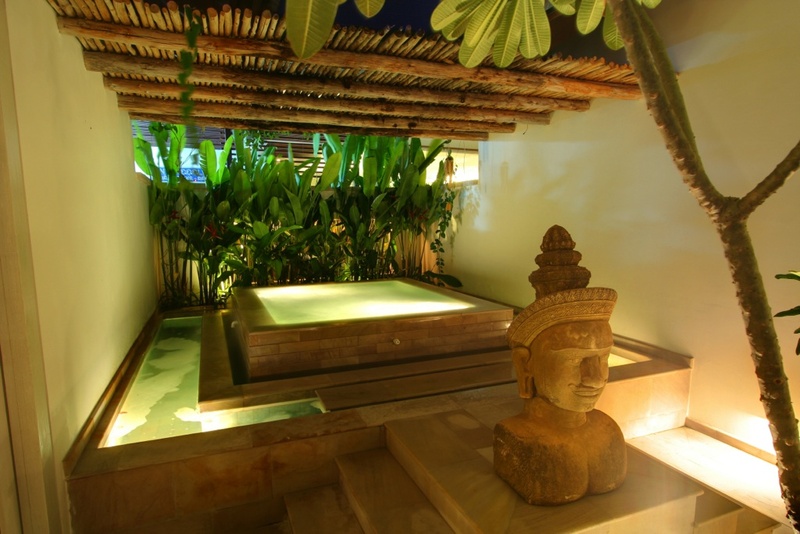 After the second bedroom there’s a poolside recess where you will find a covered massage sala offering the perfect relaxing and private space required for an invigorating traditional Thai massage. The next room is home to the open-plan kitchen, dining and living area. This large room is extremely well designed with the kitchen area defined by a long floating island feature, which has a built in wine cooler and subtle black hobs. The back wall is lined with almost invisible white-gloss units which are punctuated only by the wall mounted chrome appliances. 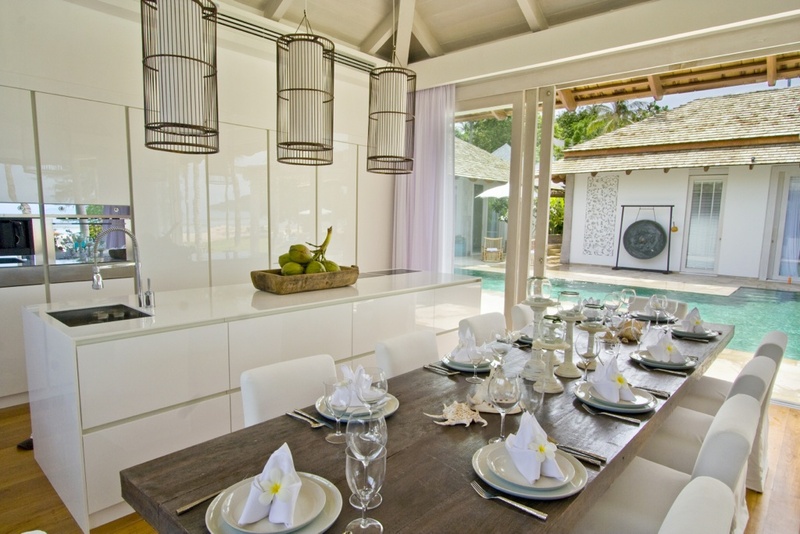 Three long bamboo lamps hang from the high vaulted limed wooden ceiling, above the island, and beyond the kitchen is a doorway leading out to a covered Thai-style kitchen. Back inside and directly in front of the kitchen is the ten-seater limed wooden dining table with upholstered white chairs. This whole open-plan area has warm wooden floors which work well to create a homely ambience in a contemporary room. 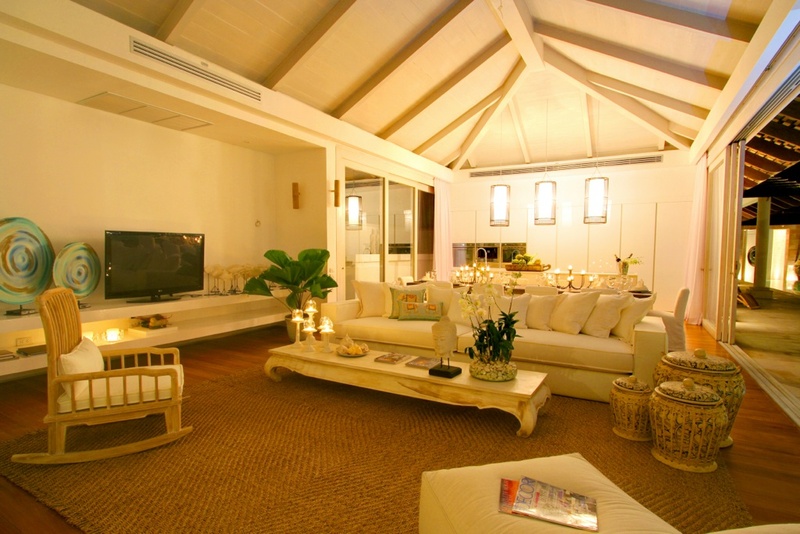 The lounge is dominated by enormous comfy white sofas sat on a rattan rug around a limed coffee table. The sofas are dressed with white and blue cushions and a couple of silk cushions with traditional elephant designs. A large flat screen TV sits on a shelf with a variety of interesting ornaments and a rocking chair completes the overall homely feel. Opening glass doors lead from the living area into a covered outdoor lounge area linking the indoor spaces to the outdoor area. Beyond this is the garden, the beach and the ocean. 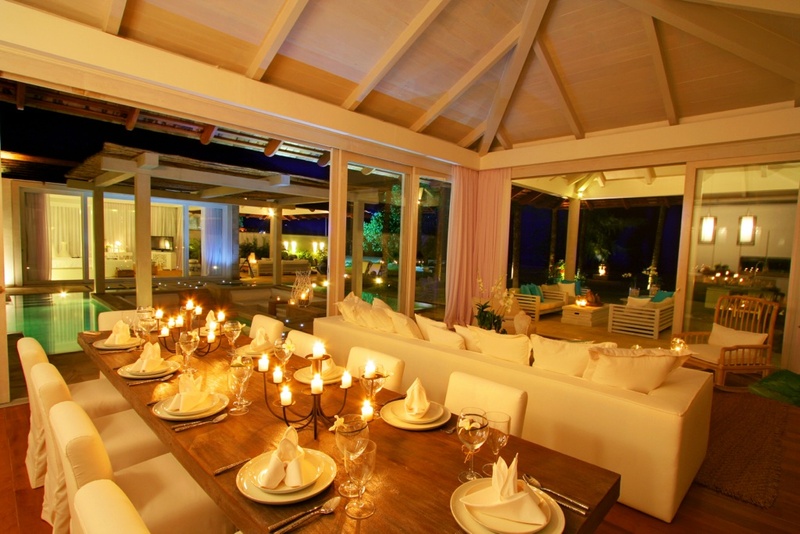 Walking across the beach in front of the villa you’ll find daybeds and a large Buddha head sculpture mounted on a marble plinth with candle holders to generate a romantic night time atmosphere. Coming back across the lawn you approach the final pavilion. 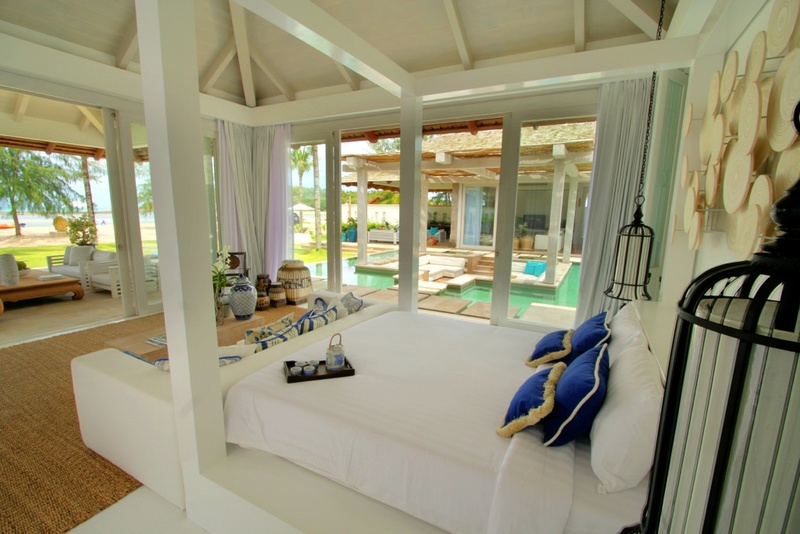 There’s another very stylish garden fronted, covered outdoor lounge area which links the master-suite to the garden. In the master bedroom white painted floors are dressed with a rattan rug on which sits another rocking chair and a comfortable white sofa and coffee table are at the foot of the bed. In this room the contrast of modern and traditional is most apparent. Traditional blue and white ceramics adorn the coffee table, which are mirrored in the blue and white cushions arranged on the sofa and the bed. A bed which is housed beneath a very contemporary white boxed four poster arrangement, with an eye-catching abstract wooden artwork mounted directly above the bed. 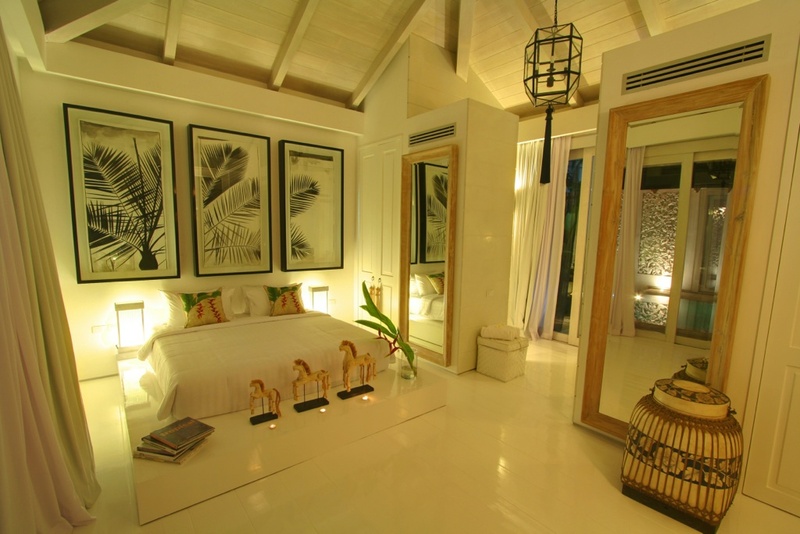 Doors on either side of the bed lead into the exquisite en-suite bathroom. 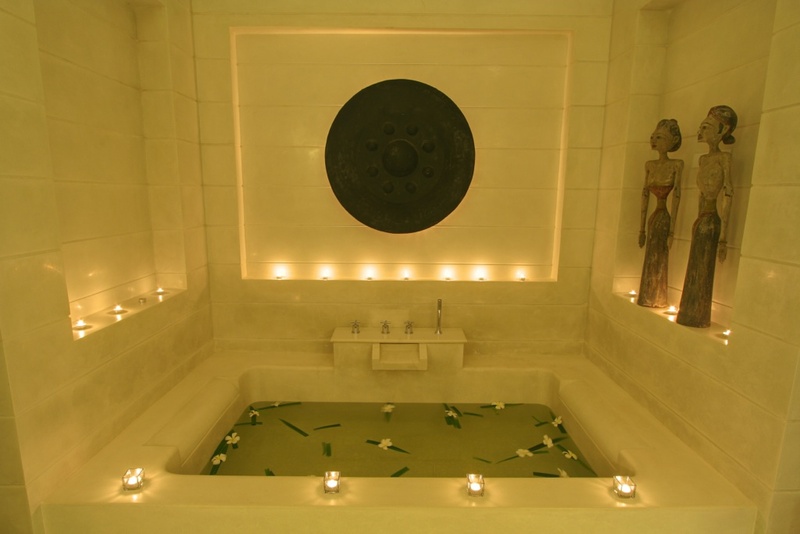 In here there’s a dressing area, twin sinks and a truly breathtaking terrazzo bathtub set into a stone recess. There’s a walk in shower area too. Heading back along the poolside terrace, past the sunken in-pool sala you come to another recess, opposite the massage area on the other side of the pool. In this area there’s a very large private Jacuzzi tub surrounded by tropical planting and complete with overflow water feature. The next two bedrooms are mirror versions of the first two bedrooms in the opposite pavilion. 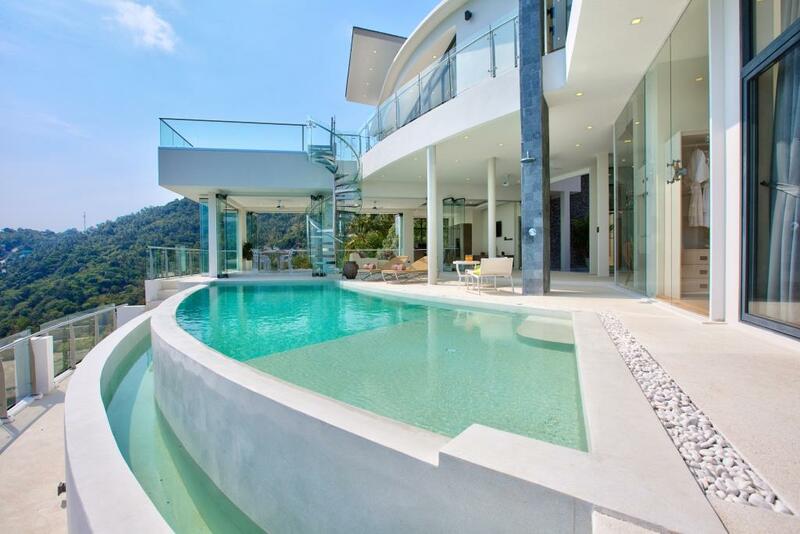 They are connected and one has an outdoor shower whilst the other has an outdoor courtyard with sunken terrazzo bathtub. 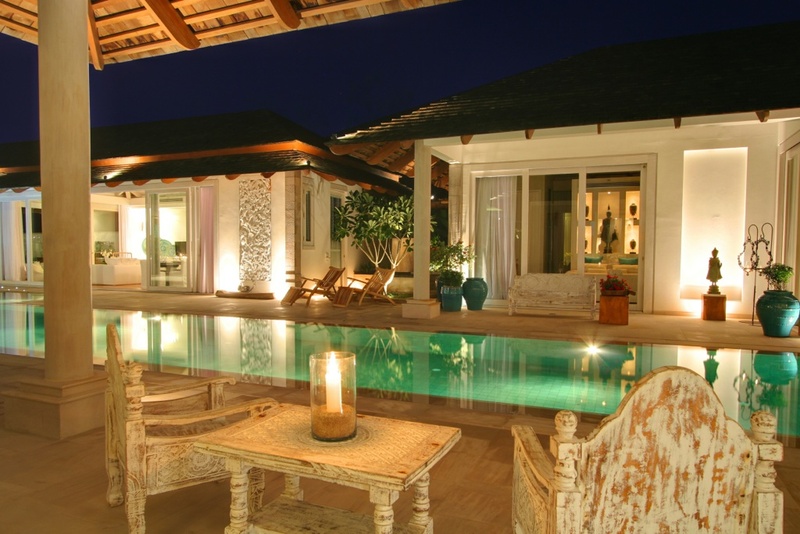 This leads you back to the main entrance area where you can look through the whole property and really understand what an exceptional holiday experience this villa offers. This is a villa which is not only pleasing on the eye but one which is also practical and offers very flexible accommodation opportunities. The location is picture-perfect and the style and luxury on offer is sure to create life-long memories.